Combine cranberries, sugar and water in a small saucepan and bring to a boil over high heat. Reduce heat and boil gently for 10 minutes stirring occasionally and gently mashing the cranberries with the back of a spoon. Let cool. Put the flour, egg and cracker crumbs on individual dinner plates. Coat the brie first in the flour, then the egg and finally the cracker crumbs, making sure it is completely coated. Heat the olive oil and butter in a medium skillet over medium heat. When the butter is melted and the oil is hot, add the brie and cook for about 2 minutes per side or until golden brown. 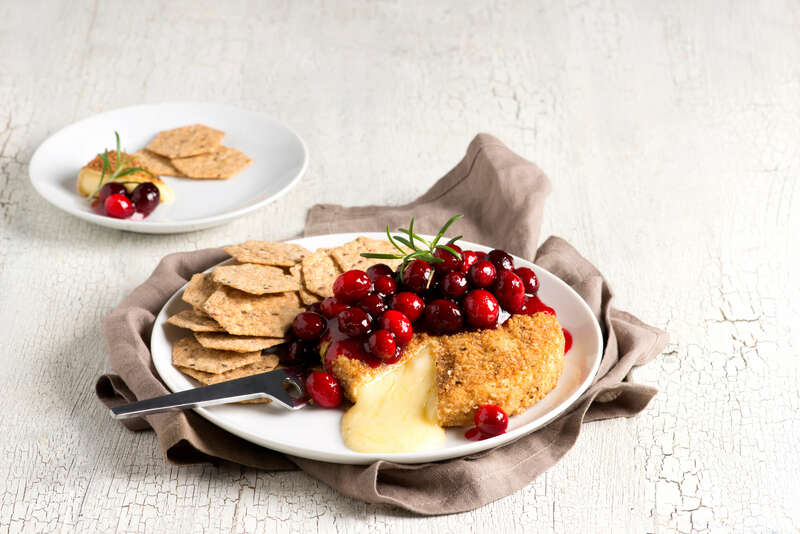 Place the brie on a serving plate and top with the cranberries. Serve with crackers.